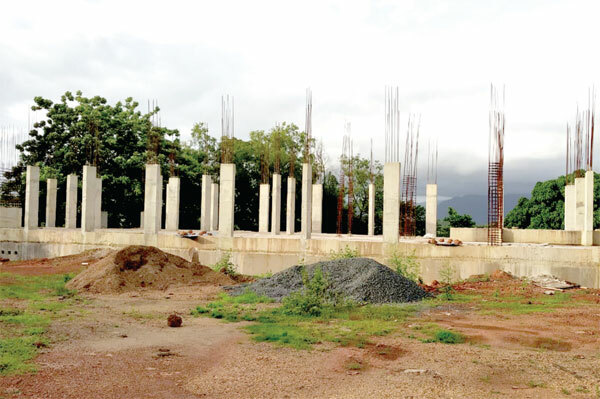 In the year 2016, the Goa Tourism Development Corporation in a bid to improve the tourism structure at the Selaulim Dam in Sanguem had demolished the old Tourism Rest House to pave way for a new structure with enhanced facilities and an increased number of rooms. However even after two years of the commencement of the project, not much headway has been made. Except for the foundation and the construction of the pillars, the has come to a standstill for reasons best known to the GTDC. Ironically the work of the renovation of the four bungalows in the vicinity of the rest house is also held back for quite some time now. It is pertinent to note here that the Government some fifteen years back had constructed four luxury bungalows at the Selaulim Dam for the benefit of the tourist and the general public visiting the Selaulim Dam. However even after the completion of the construction work of the bungalows in all respects, the bungalows were never thrown open for the public use and the bungalows lie forlorn all these years. The bungalows were also not inaugurated by the Government despite spending colossal money on its construction. As the bungalows lie forgotten and had worn a deserted look, the GTDC undertook renovation work of the four bungalows along with the construction work of the new Rest House. The bungalows are given an enhanced look by the contractor without touching their design and basic structure. However the work of giving the final touches and sorting of the internal fixtures have slowed down and remains to be done. It may be recalled that the old Tourist Rest House at the Selaulim Dam which is now demolished had six rooms on the first floor and a restaurant on the ground floor. Given the proximity of the Selaulim Dam, people visiting the Selaulim Dam particularly during monsoon would spend time at the Dam site and the botanical garden and later head to the GTDC rest house for snacks or for food. Those coming from distance places would also spend a day or two at the Rest House. However now with the demolition of the old Rest House, visitors to the Selaulim Dam are literally made to face hard times in getting snacks, tea or food in the vicinity of the Dam area. Incidentally with the work of the construction of the new Rest House taking at a snail pace, it is much uncertain as to when the project will see the light of the day. Meanwhile when 'Herald' contacted the GTDC Public Information Officer for reasons over the delay in the construction of the new Rest House, the officials urged to seek the information under Right to Information and that the information would be provided only after an appropriate application to that regard.